Alex has put the emphasis on delicious everyday comfort food you can share with the family – and what better than cheese on toast. “Everyone loves cheese on toast,” says Alex. He’s created something unique for the range – bread-shaped slices of cheese that cover the toast perfectly. The cheese blankets are great and easy to use for kids. They come in three flavours – Cheddar and Mozzarella, Cheddar and Tomato Ketchup, and Cheddar and Salad Cream. You might say: But I want to do my own ketchup, mum. Alex is particularly proud of his Spudsworth melting cubes – a popular choice with his own family. “It came about by taking the kids’ three favourite cheeses, chopping them into cubes and melting it all in the microwave to pour over their jacket potatoes”, says Alex. 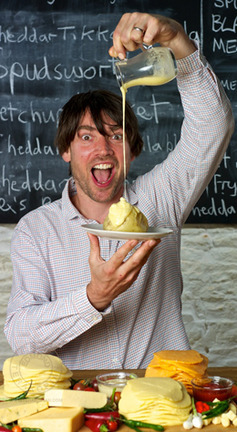 “The children have been shouting for it ever since.” Alex tells you more about his Spudsworth creation – and why his kids prefer it to his posh award-winning cheeses – on his Aisle Spy blog post. Alex’s range certainly offers you the chance to discover tastes you’ve never encountered before … his cheese wedges are packed with delicious and often quirky flavours. And for customers who fancy sticking to a more traditional taste, there’s Alex’s Best Ever Mature Cheddar.